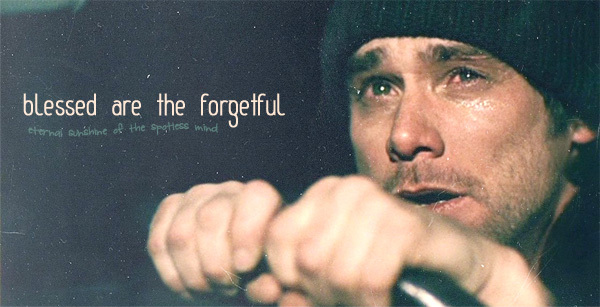 …is ‘Eternal Sunshine of the Spotless Mind’. Written by Charlie Kaufman, it stars Jim Carrey and Kate Winslet in what I think are their best performances so far. Before watching this, most people associated Carrey with his exaggerated slapstick comedy and perhaps were slightly reticent about his broader acting skills (although ‘The Truman Show’ demonstrated his innate potential); however, I was blown away by his subtle and utterly convincing performance as Joel Barish, a sensitive and introverted character who is heartbroken after his girlfriend Clementine Kruczynski breaks up with him and has memories of their relationship erased. I should probably state here that the film falls into the genre of ‘romantic dramedy science fiction’. Admittedly this is an incredibly niche area but please do not be put people off if you are not usually keen on sci-fi as the film seamlessly and convincingly transports you into this alternative universe where erasing memories is possible. And who hasn’t, at one point or another, felt that ‘forgetting’ would improve things? Upon finding out that Clementine has erased all memories of Joel, he immediately plans to do the same; however, in the middle of this process, he finds himself trying to cling desperately onto the memories of their relationship. Whether good or painful, they are dear to him and he finds out too late that he does not want to lose memories of what time they spent together. I am sure this is something that we can all relate to; the wish to blot out the past and move on afresh. However, what this film so beautifully demonstrates, sadness and happiness are part of being real and human. To erase this is to erase your experiences which make you the person you are. Another reason I love the film is because of the character of Clementine. She’s not your typical female character; she can be inconsiderate, selfish but more importantly, she’s a lot more real than the average Hollywood starlet. One of my biggest gripes in films is the stereotypical portrayal of the ‘quirky’ female lead (thanks, Zooey Deschanel). No, you are not quirky or a little bit ‘wacky’ simply because you have a fringe, wear babydoll dresses with coloured tights and retro glasses. Nor are you quirky because you spout ‘random’ inane statements that people find odd but also quite cute. Give me an outright mental female character any day, complete with mental patient gown and straggly hair – there’s just something so formulaic about this twee shite that seems so ubiquitous at the moment. Clementine is probably one of the best portrayals of real, insecure and flawed female lead in film history. On the outset, she appears extroverted with her colourful hair and her eccentric taste in clothes. She is fickle, cheery and noisy but there is nothing pretentious about her. I think it is something to do with her acknowledgement and acceptance of her flaws and imperfections (‘I’m just a f**ked-up girl who’s lookin’ for my own piece of mind’) that is particularly appealing. Her fiery personality is in stark contrast with Joel’s and that is what makes him (and most of the viewers, I’d imagine) love her.